A book to help your little one through childhood fears. My 2-year-old has developed some childhood fears. It has gotten to the point where I decided I could use some backup to help me navigate this phase. That’s where Trace Moroney’s When I’m Feeling Scared comes in. I have mixed feelings about this book. Not because of the way it is written, which is effective and useful, but because in our home, it actually introduced a few new fears whilst addressing a few that are already established. I did screen it first, but decided upon a calculated risk. This book does its job. My son seems to be receiving the message that fears are OK and there are ways to work through them. Books are incredibly powerful learning tools and I am forever grateful to have them at my fingertips. I am certainly leaning on When I’m Feeling Scared to help me negotiate the fear-riddled waters of toddlerdom. That being said, there are a couple of illustrations in this book about which my son has been quite curious and about which he has subsequently expressed new fears. It’s important to remember that my son is not in the target demographic for this book and I’m sure that’s a significant contributor to this outcome. Regardless, do make sure your child won’t acquire more fears from reading this book or similar before taking it home, even if they are in the demographic sweet spot. Following the conclusion of the story there are notes written by a psychologist to support the parent through this stage, though these notes aren’t extremely thorough or detailed. You can grab this book from pretty much any Australian book store, or find a copy online at: http://www.goodreads.com/book/show/701332.When_I_m_Feeling_Scared. 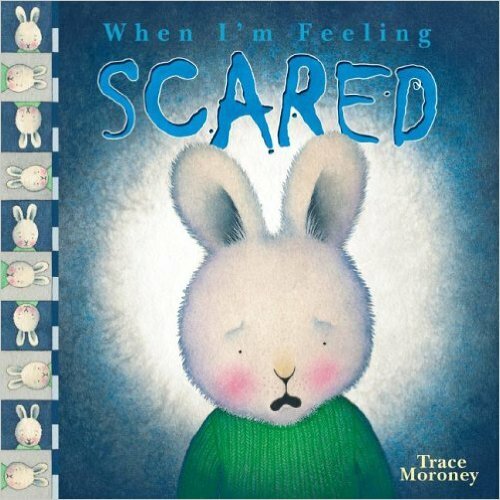 When I’m Feeling Scared is written and illustrated by Trace Moroney. It is one in a series of When I’m Feeling books. Published by The Five Mile Press. ← No mistake about this awesome book!